It’s a little uncanny how easily Shakespeare’s tragedy lends itself to reinvention by a troupe of clowns and still communicates the full measure of the poet’s intent, yet that is exactly what happens in Fours Clowns Presents Hamlet, a guest production at The Shakespeare Center of Los Angeles. To director Turner Munch’s credit, not only does he understand the funny – of which there is plenty in this production – he also knows how to play it off against its polar opposite to create palpable dramatic tension. And he does it with surprising finesse. 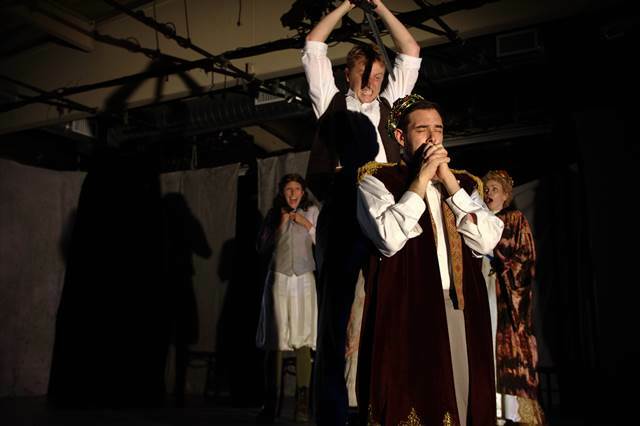 This is Shakespeare for people who hate Shakespeare, and for those who love it, for purists and dilettantes, and anyone who wants to see a story told with humor and creativity. More than anything, the 90-minute production is simply a great night at the theatre. It helps to have a cast who plays full out, at times heartbreakingly so. You expect it to be funny (it’s clowns for goodness sake) but when the moment spins on a dime and lands a stupefying blow to your gut or your heart, that’s when you appreciate how the play has truly become the proverbial putty in their hands. Hamlet (an excellent Andrew Eidon) on his mother and stepfather’s leash becomes Hamlet on a lunacy bender once the red nose goes on. And just when you think he can’t push the madness any further he pivots into a scene with the fair Ophelia (sweetly played by Elizabeth Godley) that is as delicate and touching as you’d find in any serious production. How the actors realize these scenes is often so beautiful and revelatory that I don’t want to lessen the delight you’ll experience in the moment by going into detail here. Suffice it to say that by extracting the essence of a scene and physicalizing it they are able to use a minimal amount of Shakespeare’s text to tell the story. “Brevity is the soul of wit” is a mantra that this company knows well. Dave Honigman and Tyler Bremer are the skillful clowns who redefine the phrase “dopey puppy” as Hamlet’s deceptive friends, Rosencrantz and Guildenstern, and Connor Kelly-Eiding brings an endearing innocence to her role as the huggy Horatio. Each actor is well-matched to his or her character yet it is Joe DeSoto’s wild-eyed, expressive Ghost you’re most likely to remember. Play along. Have fun. This kind of Shakespeare never gets old. Just as delightful is the way the technical and design elements are integrated into the storytelling and used as building blocks for the action: Elena Flores (costumes, hair & make-up), Alexandra Giron (set and props), Mcleod Benson (lighting), Matt MacCready (technical design), an uncredited but terrific sound design, and Matt Franta’s fight choreography all have exceptional moments.